"He was the most complete thoroughbred the industry has ever seen." Mickey Taylor spoke these words at the time of Seattle Slew's passing on May 7, 2002. The words have great meaning, for there has never been another quite as impressive as Seattle Slew in the context of how completeness is defined in the thoroughbred industry. The definition lies within the two major categories of performance as a racehorse and performance as a stallion. His owner's declaration is very apropos. Seattle Slew's legacy in both categories is the stuff of legends. But Seattle Slew was even more than that. As a racehorse and stallion his abilities were so wide-ranging that he must be considered to be at the top of both of those categories individually. On March 9, 1977 Seattle Slew delivered a powerful performance that showcased his well-rounded and complete ability as a racehorse. Thoroughbred races fall under two categories. "Route" or "distance" races are races of a distance of one mile or more. "Sprint" races are races of a distance of seven furlongs or less. It is very rare to see a racehorse that is a master at both route and sprint races. We were privileged to see that versatility in Seattle Slew. In the 1976 Champagne Stakes, a route race, Seattle Slew had shown phenomenal ability. Later in his career, Slew would compete brilliantly and courageously in route races, winning at all the classic distances. But on March 9, in a seven-furlong sprint race, he put forward a performance that was arguably as good as any ever put forth by the sprinting specialists that came before or after him. His performance that day is another piece of evidence that helps shape the author's opinion that Slew is history's most complete thoroughbred racehorse. Seattle Slew shipped to Florida just prior to Christmas in 1976. In January of 1977, Mickey Taylor assumed full responsibility for managing Seattle Slew. Unhappy with the security measures surrounding the horse, Mickey turned to the trustworthiest people he could imagine. His parents, Chet and Leola Taylor joined the entourage and became the night watch team. Together with their tough, but lovable Doberman Pinscher "Lance," they gave Slew the utmost attention. The one aspect of Slew's career that Mickey Taylor did not take part in or give advice about was training. He left that to Billy Turner. 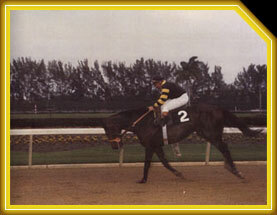 Turner had used the month of January mostly for galloping Seattle Slew at Hialeah Race Course. The real workouts began in February. Throughout his career, Seattle Slew was renowned for his brilliant workouts. At Hialeah, he jumped right back into training with a series of very quick works. One morning, Slew broke the existing five-furlong Hialeah track record by breezing :56 in a workout. To break a track record in a workout is amazing, and Slew did it while being restrained. For Seattle Slew's 3-year-old debut the Slew Crew chose a seven-furlong allowance event on the second day of Hialeah's spring season. An hour prior to the race, Slew didn't seem very interested in running as he lay down with Lance and went to sleep with his head on the floor of the stall. Turner was concerned and ordered a temperature check, which turned out to be normal. All was fine with Slew. He just happened to be doing things his way, which was invariably the best way. The race came up tough, with quality opposition in the form of Depth Finder and Smashing Native. But the toughest competition was undoubtedly White Rammer, a 3-year-old speed demon sprinter. Like Slew, White Rammer was also undefeated and had nothing but "1's" at every call of every race in his past-performance chart. "Some knowledgeable observers in the industry told me that White Rammer was so fast that there was no way Slew would get the lead from him," Mickey Taylor recalled. When the gates opened, White Rammer, to Slew's outside, broke smartly and assumed a brief lead. White Rammer's jockey, Lazaro Samuell, was rousing his mount and using the whip early in an unusual and desperate attempt to get the lead and establish the pace. Slew would have none of it and quickly rushed up for an early speed duel. Slew captured the lead by a head at the first call. In contrast to Samuell, jockey Jean Cruguet sat still and kept a tight restraining hold on Seattle Slew's reigns. Down the backstretch it was Slew and White Rammer battling it out with Slew setting vicious fractions of :22 1/5 and :44. As Cruguet let up on his restraining hold ever so slightly, Slew increased his lead to 2 lengths over White Rammer with Depth Finder, Irish Connection, and Smashing Native all giving a big effort and attempting to stay in contention. Around the far turn, Smashing Native moved up to take hold of third place as Samuell had the whip out on White Rammer in hopes of catching Slew or saving the second position. At the eighth pole, Slew had run six furlongs in 1:08, faster than any horse in the history of Hialeah and there was still a furlong to run. Seattle Slew's commanding 4-length advantage was widening. Cruguet eased Slew during the last furlong but the colt still extended his lead to a 9-length victory over White Rammer, with Smashing Native taking the show position. The time of the race, 1:20 3/5, was the fastest seven furlongs in the fifty-two-year history of Hialeah. And Slew did it without ever being touched by the whip while being eased during the last furlong. For a young 3-year-old making his fourth career start to finish less than a second from breaking the world record while defeating a world-class sprinter and being restrained and eased in the process is astounding. Adding to the magnitude of the accomplishment is the fact that it was Slew's first start after being away from the races for nearly five months. The record still stood when Hialeah closed its doors as a racetrack in 2001. The Daily Racing Form chart of the race contained a rare tribute that began: "Seattle Slew, in a remarkable performance, took charge from along the inside in the backstretch ..."
In his 1977 book about Seattle Slew, Steve Cady summed up the strength of Slew's performance this day with the following praise: "For raw speed, it had to be one of the most awesome displays ever seen on an American racetrack." "After the devastating return of champion Seattle Slew, various other 3-year-olds were being aimed in divergent directions instead of toward Hialeah's Flamingo Stakes. All Seattle Slew had done in his 3-year-old debut on March 9 was run seven furlongs in a track record 1:20 3/5, without ever being hit with the whip and virtually pulled up the last sixteenth-mile." Throughout his career, Seattle Slew had a devastating effect on his competition. After the race the speedy, talented, and game White Rammer was devastated. He did not eat for three days, and just stood around in his stall with his head down. He was mentally drained and deflated after being outrun the way he was. He always carried the attitude that there wouldn't be a horse that would ever outrun him. He hadn't counted on there being a Seattle Slew in his world. But, to his credit, he tried very hard and never gave up. It is very evident, while viewing the tape of the race, that he is giving an all out effort in deep stretch despite knowing he has been defeated. White Rammer recovered and continued a successful career. He retired after the 1979 campaign as a graded stakes winner and multiple stakes winner of 14 races. He won the Triple Bend Breeders Cup Handicap at Hollywood Park in 1979, finished behind the very fine Life's Hope in the 1979 Native Diver Handicap at Hollywood Park, and was runner-up to champion J.O. Tobin in the 1978 Tom Fool Handicap at Belmont Park. He was a sire of quarter horses and a sire of thoroughbreds in Pennsylvania and Oklahoma. He is still in the leading thoroughbred sire categories for those states in 2003. He passed away in 2000. Seattle Slew came out of the race in fine shape and on Monday morning, March 14, 1977, Mickey and Karen Taylor announced that he would definitely run in the Flamingo Stakes. "Billy wanted to look at him before we made up our minds," Mickey Taylor said. "He sent him out yesterday and the horse is perfect. He's better than he was when he ran last Wednesday. He's so good it's scary. He's definitely in the Flamingo, and we want to make the announcement right now so the other people with 3-year-olds can make plans to stay or maybe go somewhere else." Scary is a good adjective to describe the brilliance of Seattle Slew. One can only imagine what it would be like to witness his performances if he were ever set free to run or asked to break track records.